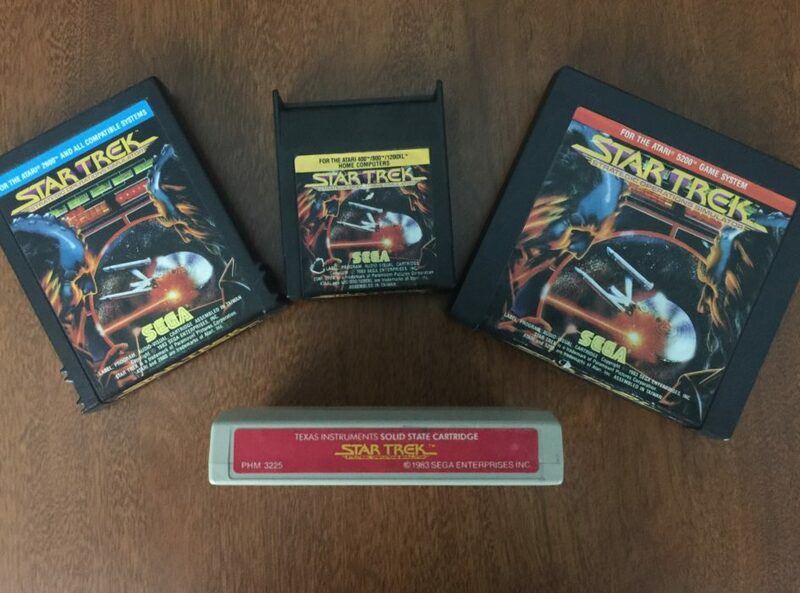 Star Trek has received at least one title on many video game consoles for last 40 years now. It’s a testament to the shows enduring legacy, as well as its fan base. These are fans who let the shows originality stir their imaginations and made them carry “The Final Frontier” into the world of video gaming only a few years after the show ended. Some of the earliest versions of Star Trek games appeared as text adventures shared on the early internet in BBS’s, or in the form of short games meant to showcase graphics rather than any kind of actual gameplay. Eventually though game designers and publishers knew a true game would have to be made. In 1979 Star Trek: The Motion Picture was released thanks in part to Star Wars: A New Hope’s success two years earlier and the constant push by Star Trek fans to bring the show back. Star Trek: The Motion Picture, although in retrospect hardly the best of the Star Trek movies, was groundbreaking in itself, and set new territory for both special effects and for Star Trek movies. You can click on the links to read my previous Trekking Through Games article about the movie. Despite that it would take another three years before any kind of video game based on the movie was made. 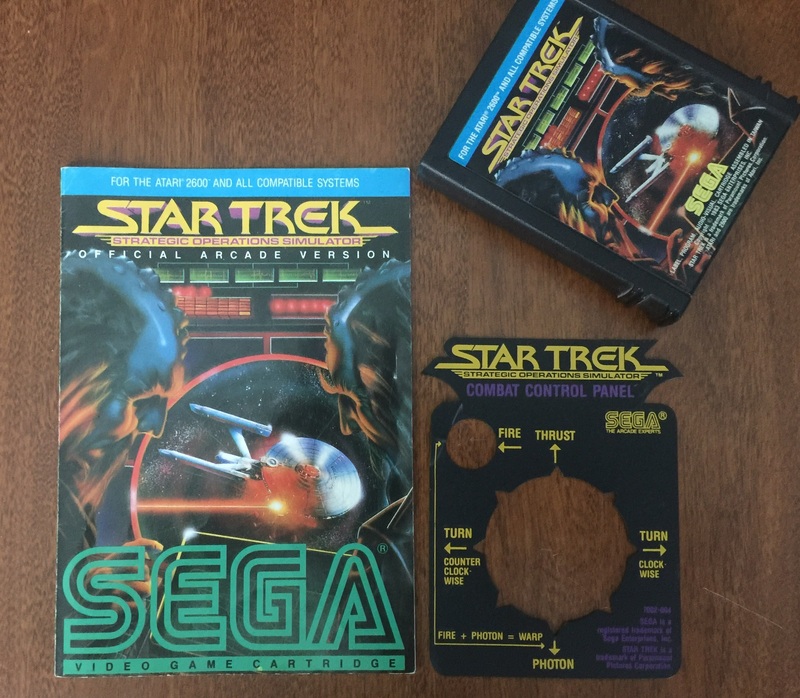 Star Trek: The Motion Picture would appear on the Vectrex in 1982, although arguably it had little to do with the actual film and more to do with facing off against show adversaries like the Klingons, and Romulans. Owning a Vectrex I can tell you both Star Trek: The Motion Picture and the sequel game Star Trek II on the Vectrex are fun and even addictive games, that ramp up the challenge quickly, but again have very little to do with either Star Trek movie. 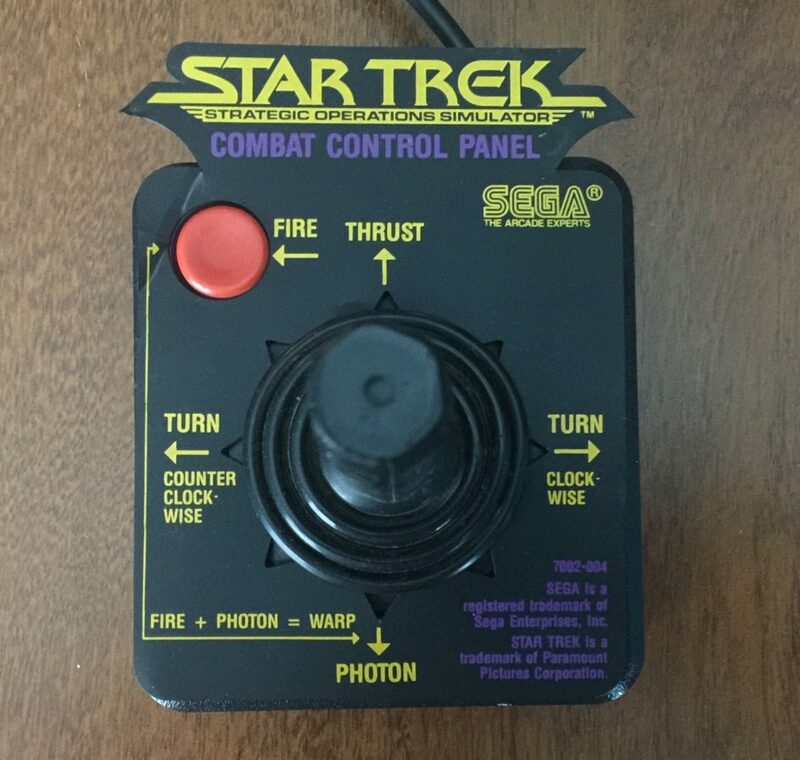 In 1982 Sega would release an arcade cabinet in both an upright and environmental form for a game called Star Trek: Strategic Operations Simulator. In its arcade form the game screen was broken into three split screens, the top left was dedicated to ships systems such as shield strength, photon torpedo count, and warp engines. The upper right was a map of the sector showing the nearest starbase, enemy units, and any asteroids that may appear. The third and biggest section was the entire bottom of the screen which gave a first person view from the Enterprise’s bridge viewscreen as you encountered starbases, enemies, and the like. Despite being a vector based game, there is a lot going on with the game’s single monitor. The ship controls themselves are a lot like that of Asteroids with a button to thrust forward, but with a dial for side to side movement. Other buttons fired phasers, photon torpedoes, and raised the shields for brief periods. Although it wasn’t exactly the kind of game one masters in the first sitting, it is a highly entertaining game that is easy to pick up with a little practice. Sadly though, not many of the arcade cabs of this game survived and the environmental version known as the “Captain’s Chair” is even rarer than the upright. Luckily, the game received many home ports almost immediately and despite lacking the vector graphics most of these ports are fairly close to the arcade version. 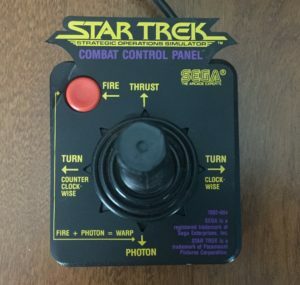 If you know anything about what consoles and computers were on the market in 1983, than no doubt you can guess the systems Star Trek: Strategic Operations Simulator was released on almost like naming off a list of usual suspects. The Atari 800, 2600, and 5200, C64, Ti-99, ColecoVision, Vic-20 and the Apple II all saw ports of this game. In my collection I have four of these ports including all the Atari versions, and the Ti-99 version, and moving from system to system I have to say they are all pretty close to each other in gameplay. difficult in my opinion because well…it was meant to eat quarters. Vector based games do look pretty good graphically, and it’s always easy to tell what the 3D objects represent. Also being an arcade machine with a big board and lots of processing power for the era we also get some awesome music and sound effects. All other ports are raster based, but some look a little bit better than others. The Atari 800 and 5200 ports look like an improved version of the Atari 2600 port and the ships and other objects appearing on the bottom “viewscreen” do look a little more like what they are supposed to. The TI-99 is roughly the same, but the ships and whatnot have a bright color pallet to them that makes them feel a bit cartoony. Then comes the Apple II version which is simultaneously both better and worse than the other versions, but I would suggest you look for yourself to see what I mean. The C64 version has some really nice looking graphics too, but by far I think the Colecovision version features some of the best graphics overall, as well as the best sound, and music. Of course that surprised me since I thought the C64 or Apple II would have it hands down over any console but the Colecovision holds its own on this game. As you can tell though no matter what the version, the game pretty much stays the same with only some minor creative and technical differences between them.Basically, the game revolves around protecting your starbases from Klingon attackers, by eliminating all their ships in each sector. Of course in real Star Trek terms such battles would be highly involved, but here each Klingon ship is a one hit kill with phasers, and you can take a few at a time out with a photon torpedo. As you take damage yourself, and I mean multiple hits, you can dock with starbases for repairs and more photon torpedos. After a few levels of fending off Klingons you eventually encounter a minefield being laid by the infamous STO villain NOMAD, who you must defeat to move on the the next sector. Of course on the arcade and home ports these sector boss battles are anything but clear. On the Atari 2600 version as you will see in my video, there is a sector in between in which you encounter an asteroid and meteor field that you can maneuver around to dock with starbases for needed repairs, like a helpful bonus level of sorts. Both the arcade version and Atari 2600 versions also have “anti-matter saucers” (yeah, because that was in the show) in the arcade version they stick to you like a magnetic mine, as to where with the 2600 version they just kind of float around. You’ll note in the video a purple diamond that briefly sticks to my ship in the arcade version, and my reference to a Space Invaders like flying saucer in the Atari 2600 version. As you progress from sector to sector the game presents you with an ever increasing amount of Klingons, and NOMAD moves a little faster in laying its mines, but if you’re looking for an end to this game I honestly don’t think there is one which is pretty typical for that era. 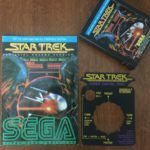 Star Trek: Strategic Operations Simulator may not be the very first Star Trek game, but it was the first to really have notice taken of it and be universally accepted, especially in the arcades as well as the many home ports. Sadly, the game never really gained any longevity, since it was white noise amongst many of the other space games of the era. Luckily for us as Star Trek fans we got many other games after, and the franchise would continue on to some truly awesome titles that would take what SOS started to a different level like the Starfleet Command and Armada games. Although Strategic Operations Simulator may seem basic and simple compared to games such as those I just mentioned, if you’re a Star Trek fan they’re something you have to really check out since they still have that connection to the first Star trek movies and the original series from an era when that’s all there was.